The warm embrace of sunshine stretches out over the North Thompson Valley like a cozy blanket full of possibilities. What will you get up to today? Hiking above the alpine, or through a blooming alpine meadow? Paddling the pristine waters of Adams Lake, or from the seat of your white water raft? Spot bears and wildlife that you’ve only imagined? Will you go chase waterfalls, keeping count of each extraordinary one, or will you saddle up for a day atop your favourite steed? Will you wind down over a campfire, dinner sizzling in the pan, or gear up for a night of music in the great outdoors? 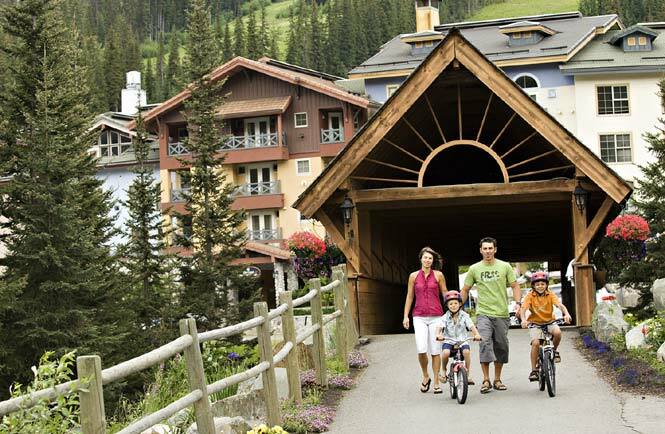 Make the most of summer’s long days and pack as much (or as little) as you want in your North Thompson Valley vacation. In the hot, sunny days of summer, exploring the North Thompson Valley has no time limit. Just pick your destination and head out. Raft and paddle along the Clearwater, South Thompson, North Thompson, and Fraser Rivers, or along a quiet alpine lake in a Voyageur canoe. Feel the mist from Helmcken or Moul waterfalls, or the burn in your legs after a hike through alpine flowers in the Trophy Mountains, or atop Sun Peaks. Soar by helicopter above the highest peak in the Canadian Rockies, Mount Robson, landing near Berg Lake. Take a high speed River Safari, searching for bears, moose and eagles you just know are roaming nearby. Get back in the saddle, or take in a time-honoured family tradition at the North Thompson Fall Fair and Rodeo. There’s no need to stop exploring, all you need is the time. Rivers and lakes bind the North Thompson Valley, and hold no limit for fun. Make a splash as you hit the rapids on the Fraser, North Thompson, Adams and Clearwater Rivers. Marvel in the raw beauty of the rumbling waterfalls throughout Wells Gray Provincial Park, including Helmcken Falls, the fourth highest waterfall in all of Canada. Canoe or kayak Murtle Lake, North America’s largest paddle only lake where a rugged back country camping experience can be had on its sandy shores. Reach back in time and glide through the waters as our earliest explorers did — by Voyageur canoe. Dry off at the end of your adventure, then ask yourself — when was the last time you had such unadulterated fun? Follow your wanderlust. It’s easy in the North Thompson Valley where trail after endless trail leads you to dramatic vistas – many you’d expect to see on a postcard! A patchwork quilt of colours dominates the landscape when you trek the blossom (Alpine/SP Blossoms) painted slopes of Sun Peaks Resort. Venture into trails in Barriere and find brilliant views — the rounded crests of mountains, fields of green meadows, and spring-fed clear blue lakes. Take a guided hiking excursion in the Trophy Mountains of Wells Gray with three, five, or seven-day journeys high above the alpine that lead from hut to hut, along the spine of the mountains. Hike up or Helicopter in? It’s your choice whether you want to make the trek up the Berg Lake trail to the teal-blue lake some 1,650 metres (5,413 feet) in elevation, or be dropped by helicopter after a scenic tour of Mount Robson — the farthest reaching peak in the Canadian Rockies. While in the “North” Thompson Valley, find plenty of ways to experience the best of the west. Start with an extended stay at Jandana Ranch where you can help out at the ranch and learn how to talk to horses. If you’d rather watch the real cowboys in action, then visit during the first weekend of each September when the North Thompson Fall Fair and Rodeo rolls into Barriere. Salmon and Birds and Bears Oh My! 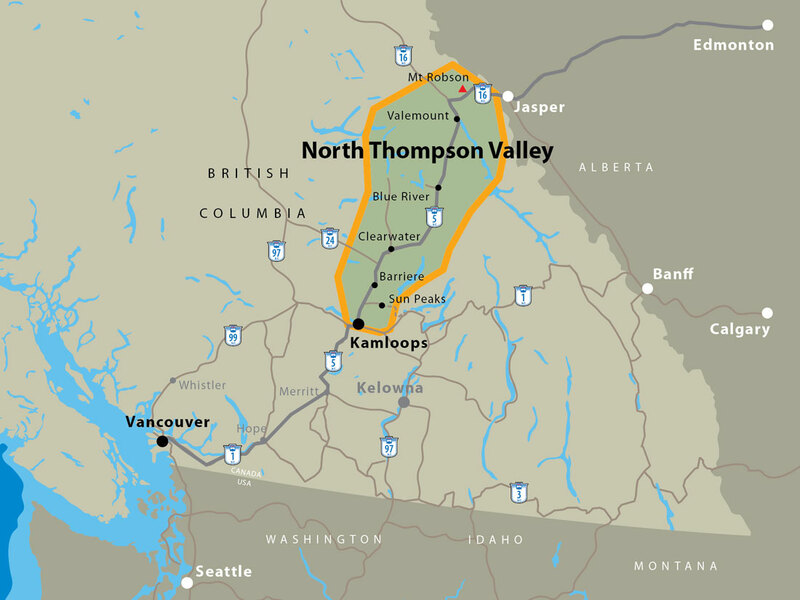 The North Thompson Valley is one of those last vestiges where the iconic animals so closely identified with untamed Canada, can still be found roaming free in their natural, original habitat. Sit back and relax in a comfortable jet boat while you keep a steady eye on the shore. With a River Safari Tour, in Blue River, bear sightings are all but guaranteed, and the magnificent beasts are a wondrous sight. Visit the protected wetland of Cranberry Marsh in Valemount and see winged creatures use this area as their migration route, flying right along the Rocky Mountain Trench. Hold your breath and watch the Pacific Salmon jump out of the raging water as they make their final run up Rearguard Falls — near Valemount, the end of their four-year roundtrip journey from the Fraser River to the Pacific Ocean and back. Celebrate their life with British Columbia’s longest Salmon Run on Adams River.